This species is accepted, and its native range is Macaronesia, N. Africa, Europe to Siberia. An erect stout perennial herb up to 2(2.5) m tall An erect stout perennial herb up to 2(2.5) m tall. Stems brownish-red to greenish-brown, longitudinally striate, glabrous. Stems brownish-red to greenish-brown, longitudinally striate, glabrous. Lower leaves up to (3.5)6–26 × 5–14 cm, lanceolate or oblong-lanceolate, narrowed and attenuate to the base, sometimes ± cordate, undulate and crisped on the margins, glabrous or with papillae on the veins beneath; upper leaves often linear, acute at the apex, cuneate or rounded at the base often asymmetrically so; petiole up to 20 cm long, as long as or shorter than lamina, 1–3 cm long in stem leaves Lower leaves up to (3.5)6–26 × 5–14 cm, lanceolate or oblong-lanceolate, narrowed and attenuate to the base, sometimes ± cordate, undulate and crisped on the margins, glabrous or with papillae on the veins beneath; upper leaves often linear, acute at the apex, cuneate or rounded at the base often asymmetrically so; petiole up to 20 cm long, as long as or shorter than lamina, 1–3 cm long in stem leaves. Ocrea 1–2 cm long, striate, entire Ocrea 1–2 cm long, striate, entire. Flowers hermaphrodite or unisexual, pedicellate, in congested many-flowered whorls, arranged in rather dense branched panicles; pedicels filiform, up to 0.3 mm in diameter, unequal, up to 1 cm or more long in fruit, articulated below the middle Flowers hermaphrodite or unisexual, pedicellate, in congested many-flowered whorls, arranged in rather dense branched panicles; pedicels filiform, up to 0.3 mm in diameter, unequal, up to 1 cm or more long in fruit, articulated below the middle. Outer perianth segments 1.5–2.5 mm long; inner perianth segments 3.5–6 × 3–5(6) mm, broadly ovate-triangular to ovate-cordate, strongly reticulate, usually one segment with a developed dorsal tubercle near the base, the others with or without small tubercles; margins entire, wavy or very slightly toothed towards the base Outer perianth segments 1.5–2.5 mm long; inner perianth segments 3.5–6 × 3–5(6) mm, broadly ovate-triangular to ovate-cordate, strongly reticulate, usually one segment with a developed dorsal tubercle near the base, the others with or without small tubercles; margins entire, wavy or very slightly toothed towards the base. Stamens 6; filaments 2.5 mm long; anthers 0.2–0.3 mm long, oblong Stamens 6; filaments 2.5 mm long; anthers 0.2–0.3 mm long, oblong. Ovary 1.5–2 × 0.7–1 mm, trigonous Ovary 1.5–2 × 0.7–1 mm, trigonous. Nut brown, shiny, 2.5–3 × 1.5–2 mm, sharply trigonous. Nut brown, shiny, 2.5–3 × 1.5–2 mm, sharply trigonous. A weed of disturbed ground in damp places and beside irrigation channels; 0–1700 m.
Mozambique Zimbabwe ZAM W, ZAM S, ZIM W, ZIM C, ZIM E, MOZ M Zambia Native of Europe and western Asia, now widely introduced throughout Africa from Egypt to the Cape and elsewhere. A stout, ± glabrous perennial. 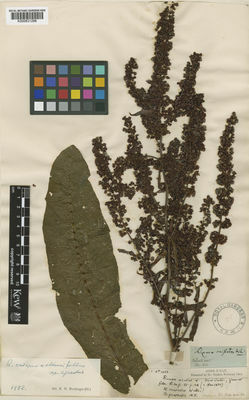 Leaves sometimes tending to redden, glabrous except for papillae on the veins of the subsurface, narrowly oblong-lanceolate, 15–26 × 2–5.5 cm. (–35 × 8 fide Rech. f.), the upper ones often linear; crisped on the margins; apically ± acute, basally attenuate, cuneate, or rounded, often rather unequally so. Lower petioles up to 20 cm. long; those of the stem leaves much shorter, often 1.5–3 cm. Inflorescence a rather dense, branched panicle. Inner tepals 3.5–5 mm. long, and as broad or nearly so, ovate-deltoid, usually all tubercled, the margins entire, undulating, or very slightly and shallowly toothed towards the base. Nut 2.5–3 × 1.5–2 mm., medium brown, acutely trigonous. A plant of damp places, and a weed of disturbed ground; at Nairobi it occurs “ in and along the riverbed,” at 1620 m.
Naturalizada y adventicia en Colombia; Alt. 2500 m.; Andes. Bot. Not. Suppl., vol. 3, 3: 76 (1954). Fl. Madagascar, fam. 65, Polygonacées: 4 (1953). F.C. 5, 1: 478 (1912). Rech. f. in Bot. Not., Suppl. 3 (3): 76 (1954). Lousley in B.E.C. Rep. 1941–42: 552 (1944). L., Sp. Pl. : 335 (1753).